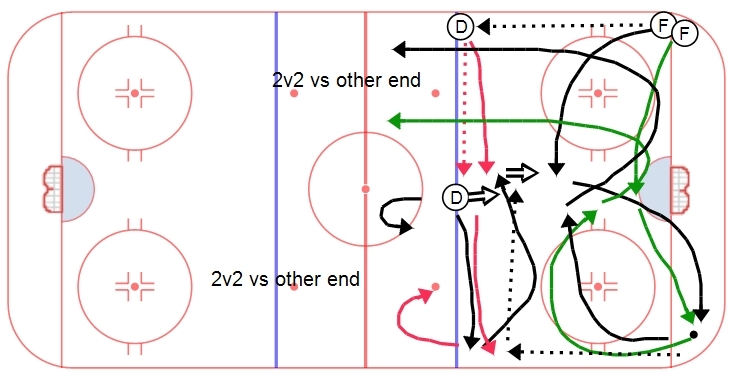 A simple full ice 2v2 rush drill with a re-gap element. The drill starts with a dump and a 4v0 breakout. Two D start at the red line and establish their gap while the group breaks out. The two F’s who broke out then attack the two gapping D in a full ice 2v2. 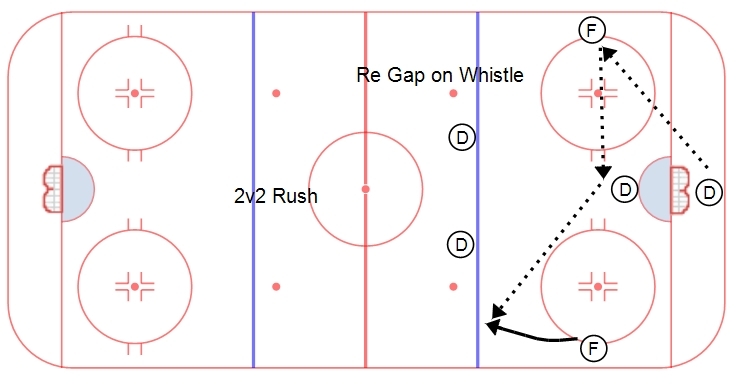 On a whistle, coach leaves a puck in the neutral zone for two F’s to retrieve and play live – the D have to retake ice and re-establish their gap. The drill then plays out 2v2. The coach doesn’t have to always blow a whistle – the players have to attack until they hear a whistle. The second puck can be left wherever, the goal is to create a situation where the D have to retake ice and establish their gap quickly. This drill can be done in one direction only, or can alternate ends.